We are and intend to remain a leading, innovative global specialty underwriter. Our improved 2016 financial results were born of our unwavering focus on success to these stakeholders. Halfway through 2016, Argo is on track. The company’s performance is improving, and we’re now getting closer to meeting our own high expectations. While much of this comes from persistent focus on our longer-term strategy, our progress is due in great part to our employees’ commitment to execution and innovation. We are and intend to remain a leading, innovative global specialty underwriter with a reliable and increasingly visible brand. In the first six months of 2016, gross written premiums grew to $1.08 billion, up 4.4% over the same period last year. Our combined ratio was 94.8% compared to 94.5% for the 2015 first half. I’m happy to note that net investment income was $56.9 million, compared to $50.1 million last year, with our alternative investment income contributing strongly. Finally, our operating earnings per share of $2.16 per share grew 10.8% from the prior year. We achieved these results notwithstanding an increase in catastrophe losses primarily due to a series of events during the second quarter, including the Canadian wildfires, the largest hailstorm in Texas history, and a series of smaller events. Finally, our net income was $58.6 million, compared to last year’s $86.7 million. All this demonstrates the value of a well balanced and diverse portfolio, which we have worked hard over the last several years to establish. We are encouraged by these results, but also recognize we must be thoughtful given the increasingly competitive landscape. Our underwriters are exercising discipline and letting go of accounts where pricing objectives are not met. This has resulted in slower premium growth, but a continuous improvement in the quality and profitability of our portfolio. I would like to begin with our U.S. results. As you know, we have spent a considerable amount of time and resource building and rebuilding various parts of our U.S. portfolio. While we still have work to do, we earned more underwriting income in these first six months than at any other time since I invested in the company in 1998. In our Excess & Surplus Lines business, gross written premiums were $314.3 million, up 2.6%, compared to the first half of 2015. Our continued success in Excess & Surplus was due in part to new technologies that help us better analyze and select risk, allowing us to drastically reduce cycle time and increase the value of the business we process. This resulted in underwriting income of $26.7 million and operating income of $46.2 million. The combined ratio of 88.9% compares to 88.0% in the 2015 first half. Catastrophe losses in the 2016 first half were $5.6 million, more than twice as much as a year ago. The 2016 first half loss ratio, excluding catastrophe losses and reserve development, was 58.4% down 1% from the 2015 first half—a terrific accomplishment considering the environment we operate in. In 2016, we saw improvement in most businesses within our Commercial Specialty segment. Growth in the first six months of 2016 came from program, surety, and professional lines businesses. For the six months ended June 30, 2016, gross written premiums were $295.1 million, up $43.2 million or 17.1% over the same period last year. Net written premiums were up 2.4% to $152.9 million, and earned premiums were up 2.4% to $172.3 million. Underwriting income was $24.7 million compared to $10.2 million in the 2015 first half. The combined ratio of 85.7% compares to 94.0% in the 2015 first half. The 2016 first half loss ratio, excluding catastrophe losses and reserve development, was 54.9% compared to 57.1% in the 2015 first half; again, a considerable impact. While the U.S. results have outshone our international business, let me say that notwithstanding the above-average cat losses, our international businesses are holding their own. Competition remains fierce in the Lloyd’s market. In what has been the toughest market in the last couple of decades, our advantage lies in our relationships, deepened over time by solid underwriting and outstanding service. In London, we are now recognized by key brokers as a leading underwriting firm. Our reputation has been bolstered by consistent messaging in a wide variety of media, and the Argo brand is well known. For the six months ended June 30, 2016, gross written premiums were $317.6 million, up $4.6 million from the 2015 first half. Underwriting income was $7.8 million compared to $16.7 million in the 2015 first half. The 2016 first half combined ratio of 96.0% compares to 92.0% in the 2015 first half. Catastrophe losses in the 2016 first half were $7.0 million or 3.5 points on the combined ratio, compared to $1 million or 0.5 points on the combined ratio in the 2015 first half. The 2016 first half loss ratio, excluding catastrophe losses and reserve development, was roughly similar at 52.7%. For the six months ended June 30, 2016, gross written premiums were $153.2 million, down $9.9 million or 6.1% from $163.1 million in the 2015 first half. Underwriting income was $10.3 million compared to $13.3 million in the 2015 first half. The 2016 first half combined ratio of 86.9% compares to 81.8% in the 2015 first half. Catastrophe losses in the 2016 first half were $12.0 million or 16.6 points on the combined ratio compared to $1.0 million or 1.4 points in the 2015 first half. The 2016 first half loss ratio, excluding catastrophe losses and reserve development, was 48.0%, compared to 49.5% in the 2015 first half. In Brazil, despite the continuing climate of political and economic disruption, a balanced social response has seen favorable reaction in the markets. Our long-term investment in Brazil is working well for us, and the digital platforms and products we prototyped there are now mature and replicable elsewhere. We have also discovered an exceptionally innovative, entrepreneurial spirit within the team in Brazil yielding several valuable ideas in the digital space that we’ve been able to apply to the business globally. In fact, that culture is now carrying over to our digital team in New York as well. In these first six months, we continued to simplify our business processes. Today, we do our work faster and with fewer steps than before. We’re making the experience of working with Argo more simple, intimate and digital. That efficiency will give us the freedom to relocate some employees to more client-facing roles where we can focus our talent on meeting the evolving needs of our customers, whose own business are changing rapidly. We have also seen increased business from our top producers while eliminating under-performing or unprofitable relationships. The referendum signaling Britain’s likely exit from the European Union on June 23 was a major international event with deep implications. That said, we have experienced no significant disruptions in our insurance activity, and our investment portfolio is performing well. We believe that regulatory changes affecting our business will be introduced over years, not months. It is important to note that we already have an insurance company licensed in continental Europe. As changes become known, we will take any steps needed to accommodate a restructured international configuration. Argo Group has seen gross written premiums and net investment income grow in the first six months of 2016. 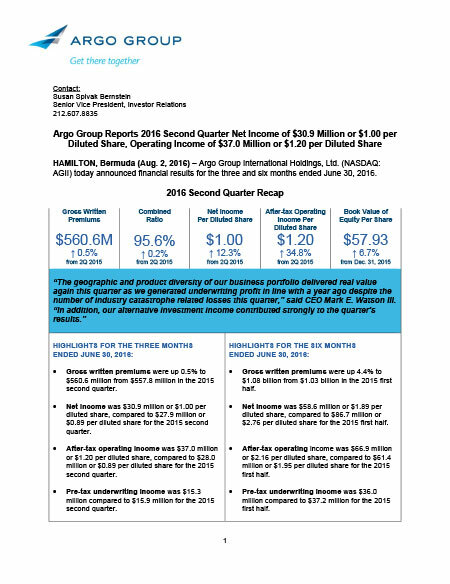 Argo Group gross written premiums grew to $1.08 billion for the first half of 2016 showing increases almost across the board despite competitive markets. This Mid-Year Report 2016 may include forward-looking statements, both with respect to Argo Group and its industry, that reflect our current views with respect to future events and financial performance. These statements are made pursuant to the safe harbor provisions of the Private Securities Litigation Reform Act of 1995. Forward-looking statements include all statements that do not relate solely to historical or current facts, and can be identified by the use of words such as “expect,” “intend,” “plan,” “believe,” “do not believe,” “aim,” “project,” “anticipate,” “seek,” “will,” “likely,” “assume,” “estimate,” “may,” “continue,” “guidance,” “objective,” “outlook,” “trends,” “future,” “could,” “would,” “should,” “target,” “opportunity,” “on track” and similar expressions of a future or forward-looking nature. All forward-looking statements address matters that involve risks and uncertainties, many of which are beyond Argo Group’s control. Accordingly, there are or will be important factors that could cause actual results to differ materially from those indicated in such statements and, therefore, you should not place undue reliance on any such statements. We believe that these factors include, but are not limited to, the following: 1) unpredictability and severity of catastrophic events; 2) rating agency actions; 3) adequacy of our risk management and loss limitation methods; 4) cyclicality of demand and pricing in the insurance and reinsurance markets; 5) statutory or regulatory developments including tax policy, reinsurance and other regulatory matters; 6) our ability to implement our business strategy; 7) adequacy of our loss reserves; 8) continued availability of capital and financing; 9) retention of key personnel; 10) competition; 11) potential loss of business from one or more major insurance or reinsurance brokers; 12) our ability to implement, successfully and on a timely basis, complex infrastructure, distribution capabilities, systems, procedures and internal controls, and to develop accurate actuarial data to support the business and regulatory and reporting requirements; 13) general economic and market conditions (including inflation, volatility in the credit and capital markets, interest rates and foreign currency exchange rates); 14) the integration of businesses we may acquire or new business ventures we may start; 15) the effect on our investment portfolios of changing financial market conditions including inflation, interest rates, liquidity and other factors; 16) acts of terrorism or outbreak of war; and 17) availability of reinsurance and retrocessional coverage, as well as management’s response to any of the aforementioned factors. In addition, any estimates relating to loss events involve the exercise of considerable judgment and reflect a combination of ground-up evaluations, information available to date from brokers and cedants, market intelligence, initial tentative loss reports and other sources. The actuarial range of reserves and management’s best estimate is based on our then current state of knowledge including explicit and implicit assumptions relating to the pattern of claim development, the expected ultimate settlement amount, inflation and dependencies between lines of business. Our internal capital model is used to consider the distribution for reserving risk around this best estimate and predict the potential range of outcomes. However, due to the complexity of factors contributing to the losses and the preliminary nature of the information used to prepare these estimates, there can be no assurance that Argo Group’s ultimate losses will remain within the stated amount. The foregoing review of important factors should not be construed as exhaustive and should be read in conjunction with the other cautionary statements that are included herein and elsewhere, including the risk factors included in our most recent reports on Form 10-K and Form 10-Q and other documents of Argo Group on file with or furnished to the U.S. Securities and Exchange Commission (“SEC”). 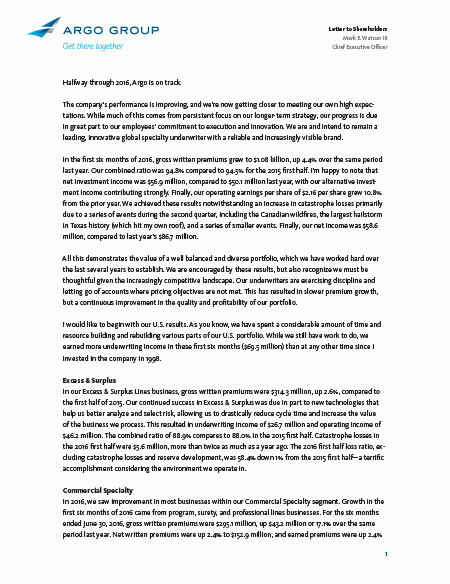 Any forward-looking statements made in this Mid-Year Report 2016 are qualified by these cautionary statements, and there can be no assurance that the actual results or developments anticipated by Argo Group will be realized or, even if substantially realized, that they will have the expected consequences to, or effects on, Argo Group or its business or operations. Except as required by law, Argo Group undertakes no obligation to update publicly or revise any forward-looking statement, whether as a result of new information, future developments or otherwise. In presenting the Company’s results, management has included and discussed in this Mid-Year Report 2016 certain non-generally accepted accounting principles (“non-GAAP”) financial measures within the meaning of Regulation G as promulgated by the U.S. Securities and Exchange Commission, including “Underwriting income,” “Operating income” and “Loss ratio excluding catastrophe losses and reserve development.” Management believes that these non-GAAP measures, which may be defined differently by other companies, better explain the Company’s results of operations in a manner that allows for a more complete understanding of the underlying trends in the Company’s business. However, these measures should not be viewed as a substitute for those determined in accordance with generally accepted accounting principles (“U.S. GAAP”). Reconciliations of these financial measures to their most directly comparable U.S. GAAP measures, as well as segment data and the reconciliations of segment income to net income and loss ratios, are included in the tables attached to our Q2 Earnings Press Release, a copy of which is included as part of this Mid-Year Report 2016.